You’ve read our website, so you know all about us. Now we need to know about you! A phone conversation, emails, or detailed text messaging is a great way to get to know you! We will ask basic questions about your farm and your horsemanship, as well as what you are looking for in a partner. This allows us to make sure that the horse you are interested in will be a good fit. 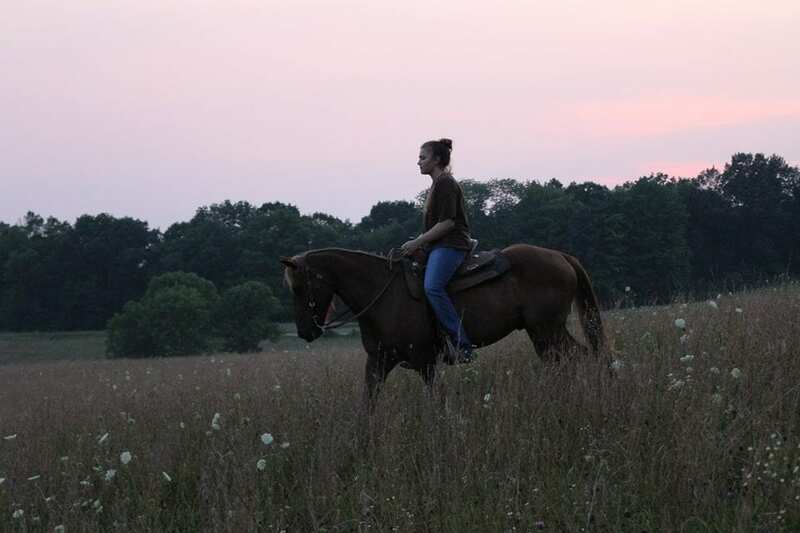 We do not have people out "just to see what we have" and kick every tire along the way... we take the time to discuss which horses would be best suited for your intended purpose, narrowing it down to a few to come and test ride. All of our horses are very unique, just like you! You must have appropriate fencing. Barbed wire is not deemed appropriate by us. Text/email us pictures! You must have a barn or shelter (a 3 sided run-in shed is fine) large enough to house all of your animals in bad weather. Text/email us pictures! You must have a vet and a farrier that will vouch for you. Have them send us a letter of recommendation. Farrier's often don't have letterhead, but a letter with a business card attached will do the trick! They can take a picture of their letter and text/email it to us, or you can bring it with you when you come. If they prefer to call, that is fine, you can have them leave your reference in a voicemail if we do not answer. We know how busy they are, and the last thing we want to do is start a game of phone tag. You must have horse experience. Elaborate. The more details, the better! We do not adopt out to first time horse owners UNLESS they are boarding the horse at a full-care boarding facility and are receiving regular lessons. This is for the safety of horse and rider! We DO adopt out of state but you have to come and meet the horse first to ensure that it is a good fit. We do not adopt out horses sight-unseen. Exceptions to this rule will be made very occasionally in special circumstances. If you have ever been convicted of animal related charges or domestic violence related charges, you are not eligible to adopt. Send us pictures of your current horses/animals. For the horses, we want to see their butts and feet! We need a picture of the trailer you will be hauling your new horse home in. It does not have to be your trailer, but it must be safe. Don't show up with an unsafe trailer that has holes in the floor! We will send you packing all the way back to Timbucktoo... EMPTY. Consider sending us a video of you or your child riding. That will help us make a better recommendation. Saying you are a "beginner", "intermediate", or "advanced" rider doesn't really help, because everyone's description of those things are different. A video is best, but if one is not available... elaborate! One of our requirements is that you must have horse experience. If you are a beginner, you MUST have a real trainer working very closely with you at a boarding facility where you can be monitored. This is not intended to be hurtful, but our horses have been through quite a bit. Rookie mistakes like incorrect tack fit and mismanagement are something that our horses should not have to deal with again. Beginners do not have to board their horses forever, BUT initially it is better for everyone involved as you learn the ropes. Our mares leave us with a strict "NO BREEDING" policy. Why? Because overbreeding is a major cause of slaughter. We don't care how sweet she is... We don't care how amazing your stallion is. Bella Run mares are NOT baby makers. We don't care if she's a Champion Gypsy Vanner that poops rainbows and speaks three languages... once she passes through our barn doors, her uterus is closed. This means that not only will you not purposely breed her, but also that you won't let her have an "accident" either. "Hunky Stallion jumped the fence and got her when we were out of town..." is NOT an excuse. Sorry. If you are worried about whether or not you meet our requirements, please don't hesitate to contact us! We won't bite, we promise! Many decisions have to be made on a case-by-case basis, so don't automatically rule yourself out without running it by us first! Who knows? We may have the perfect horse for your different situation! Once you read through the requirements here, you can get busy snapping pictures! The more pictures and info you send us about you... the better we can help you find the right match! The easiest (and fastest!) way to get approved is to fill out our online ADOPTION APPLICATION and take the NUMBER QUIZ You will soon be able to upload any pictures or videos when you fill out your adoption application. You will be asked to login, but don't worry, we do not give your informtion out... it is simply so we can keep ourselves organized. This will also allow us to send you email notifications if we think we have found a good match for you! We we are easy to deal with, and LOVE the matchmaking that goes along with rehoming our horses! We look forward to working with you! Come prepared to ride! We will have both English and western tack available here for your test ride but if you would like to bring your own, we would be happy to check saddle fit for you! Bring a helmet if you use one (you WILL be using one if you are under 21... We have some here if you don't) and wear long pants with boots. You don't have to show up with your fanciest show clothes on to prove you know what you're doing... Just wear safe, practical, weather-appropriate clothes. Since you will already be approved for adoption before you come to the farm, you are welcome to bring your trailer with you to adopt the same day! Of course, we will confirm via your driver's license that you are who you say you are... if you haven't noticed, we want our horses to be safe. If you do not bring your trailer, please be familiar with our policy on holding horses (found under the Adoption Information tab). Do not schedule an appointment and fall in love with a horse if you won't be ready to adopt for a month! While all of our horses have been fully vetted, you are welcome to a vet check from your own vet at your own expense. If you are from out of the area, we can be here for the vet appointment free of charge.